To all my east coasters/Philadelphians out there: I'll be giving a reading tonight in Newtown Square, Pennsylvania, sharing the stage with , whose voice is exquisite and rich. I love her. I've never been to a concert/book reading before. Have you? You should come. 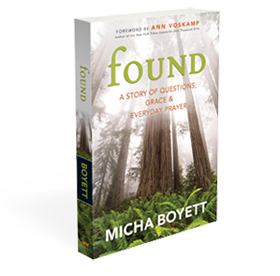 I also wanted you to know that yesterday a beautiful, honest review of Found went up at The Christian Century. I'm so honored by that doesn't sugarcoat my writing weaknesses, but still deeply grasps and honors what I was trying to do in my book. I'd love for you to take a look and share it out in the big, wide internet world.